Alam’s father was the late Ali Akbar Khan, a key figure in the introduction of Indian music to the West. He brought his sarod – a lutelike instrument with 25 strings – to California in the 1960s, were he taught Hindustani classical music for many years. This music resonates through filmmaker Joshua Dylan Mellars’ “Play Like a Lion: The Legacy of Maestro Ali Akbar Khan” from beginning to end. Shot in India and the U.S., it’s a sensual film: rich and colorful, both visually and aurally. However, there’s more to this film than music. Like his father, Alam plays the sarod. But unlike his father, he was born in America. As a result, “Play Like a Lion” is also about a father-son relationship, and about the transplanting of a musical culture from one country to another. The 37-year-old journalist turned filmmaker has made films about “exotic” world music his speciality. He’s also made documentaries about Argentinean tangos and Portuguese fado music. It was a friend (and the film’s producer) Mojib Aimaq who urged him to take on the music of India. Mellars confesses that he wasn’t sure how to approach the subject until he heard Alam Khan play a concert. Mellars shot “Play Like a Lion” during six years, from 2005 to 2011. He began by filming concerts in California and then traveled to India with Alam, to Maihar, the town where Alam’s father grew up. It was here that the Khans once performed at the court of the local maharajah. The elder Khan died in 2009, at 87, during the making of the film. His passing highlights the weight his son – six decades younger than his father – bears on his shoulders, as the inheritor of a musical tradition going back generations. Yet music is in Alam’s blood. His father’s death seems to strengthen his resolve to uphold his family’s musical status in India while promoting Indian music in America. 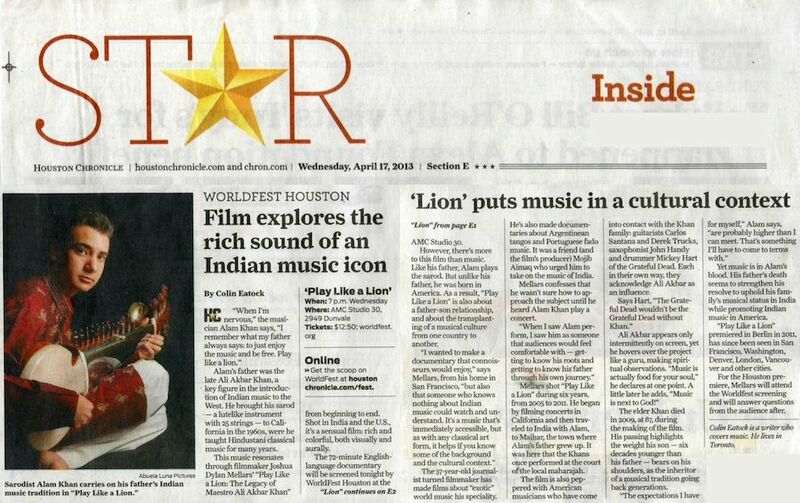 “Play Like a Lion” premiered in Berlin in 2011, has since been seen in San Francisco, Washington, Denver, London, Vancouver and other cities.